Veterinary Medicine at Cornell University where he received his DVM in 1987. After graduation, he did a fourteen month internship at Angell Memorial Hospital in Boston, Massachusetts. After five years in private practice he purchased Acorn Animal Hospital in 1994. He has overseen the growth of the practice from a very small single doctor practice to the large multi-doctor practice it is today. He enjoys all aspects of medicine and has special interest in surgery including orthopedics and ultrasound. 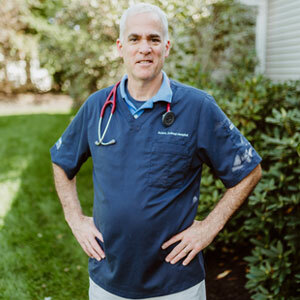 Dr. Weitzman lives in Norfolk with his wife Dr. Martha Bugbee and three children. Also living with them are two dogs and two cats.